This is the first time I’ve participated in this annual event. Thank you very much to Jennifer Cameron of Glass Addictions for hosting this event, and all her hard work with charm distribution and coordinating the Ebay auction that starts today. 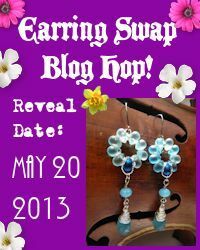 If you are new to this Blog Hop, the point is to create art charms, have a fun exchange, and auction some off to help raise funds for Beads of Courage. This year’s theme is: Love. 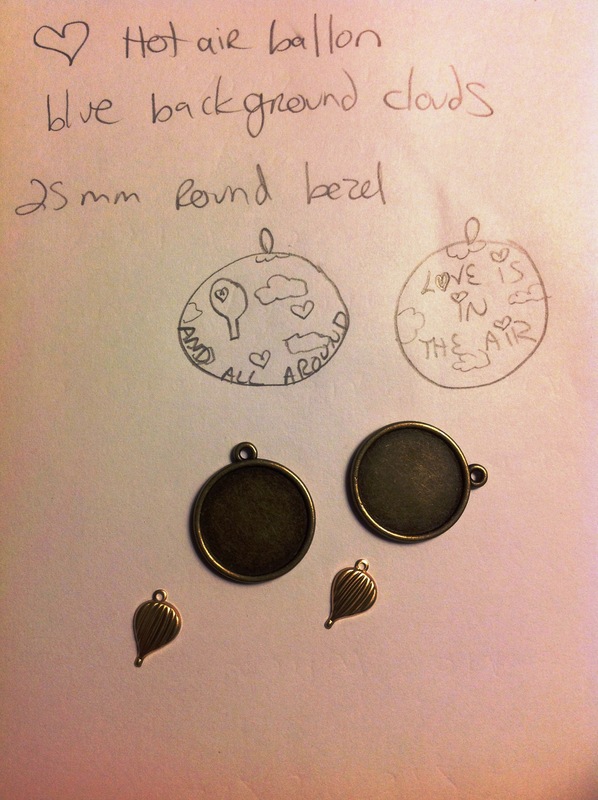 We were asked to create art charms that mean “love” to us; I also wanted to have something in keeping with what the charms are being used to raise funds for. My inspiration was the idea that love is in the air, and all around you. Whatever your age, hospitals can sometimes be scary places–you may not fully understand what is being done, you may have to spend time alone or with strangers with strange equipment, you may be afraid for yourself or a loved one. I wanted to make a charm that would be cheerful for a child, to remind them that they are loved all the time, even if they may not be where or with whom they want to be while they (or their relative) may be experiencing an illness. This was the teaser picture I posted on my Windbent page a few weeks back. 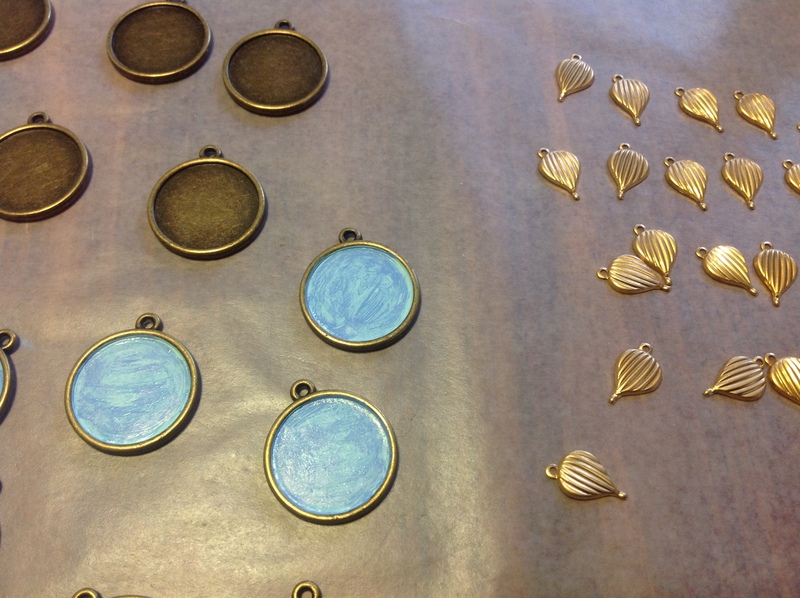 I then cut the loops off the brass charms and painted them. 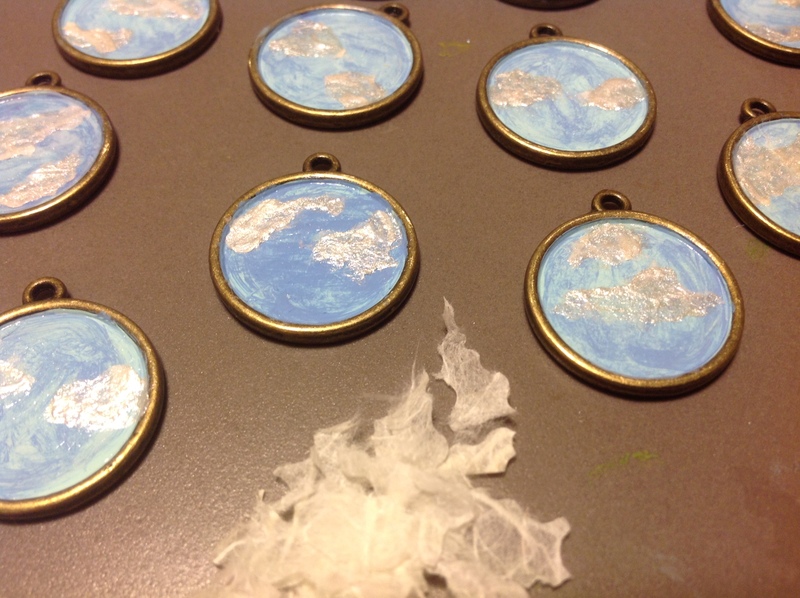 I decoupaged handmade paper to the sky for the clouds. 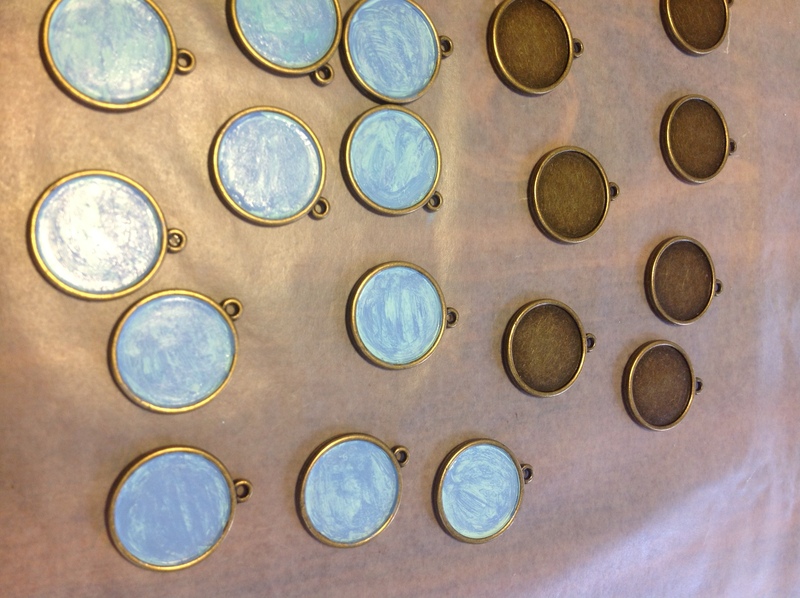 This added depth, but was more transparent than I wanted, so I painted them with Lumiere paint. I added the balloons and the rhinestones and then prepared the Ice Resin. I did not want them to dome because that would make it hard to level the other side of the charm. 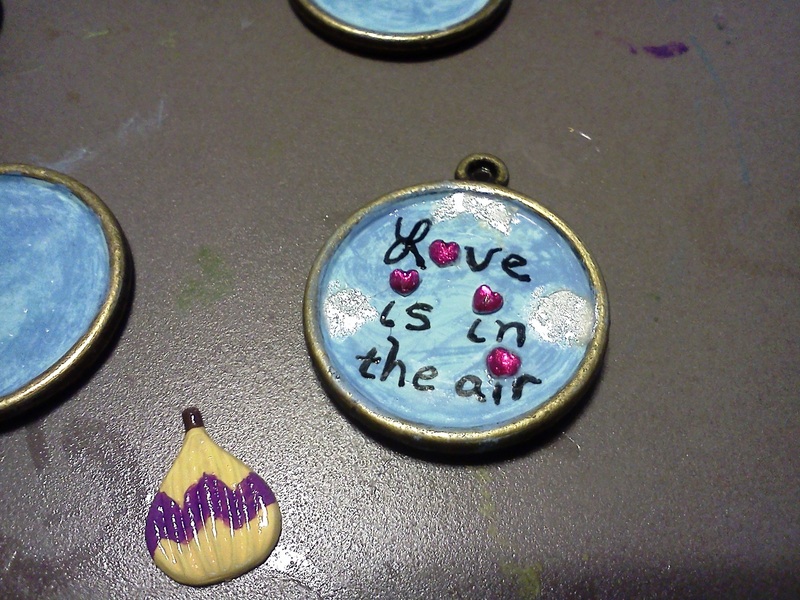 I found that if I put too much resin in the bezel, the glass of the rhinestone disappeared and it looked like a sticker–less resin allowed the hearts to stay three dimensional, so I adjusted the rest of the charms. It was challenging to stay within the working time for the resin while making 22 of these. The original idea for the back of the charm was to use stamps, but I couldn’t find anything small enough. I hand wrote them with acid free, archival black ink. The ink did not want to stay on the paint and really wanted to mix with the resin, which I was not prepared for. Here’s what I ended up with. Below are the charms I received in the swap. Each of these has their own story to tell so please follow the blog hop links down below. 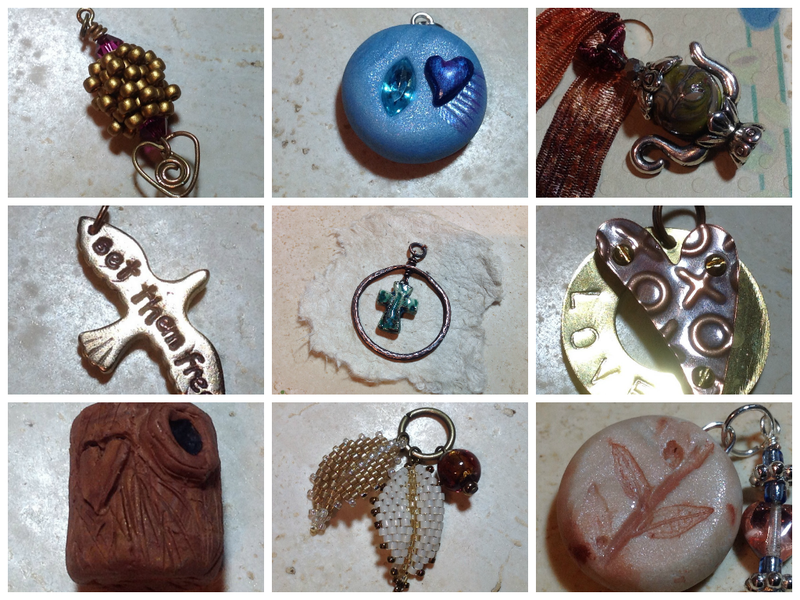 If you like any, or all, of these charms, please go to the Ebay auction to bid on the charms. 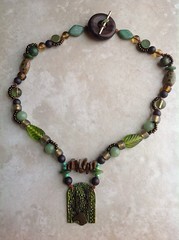 You get handmade art charms and we all raise money for a worthy cause. Win! Win! 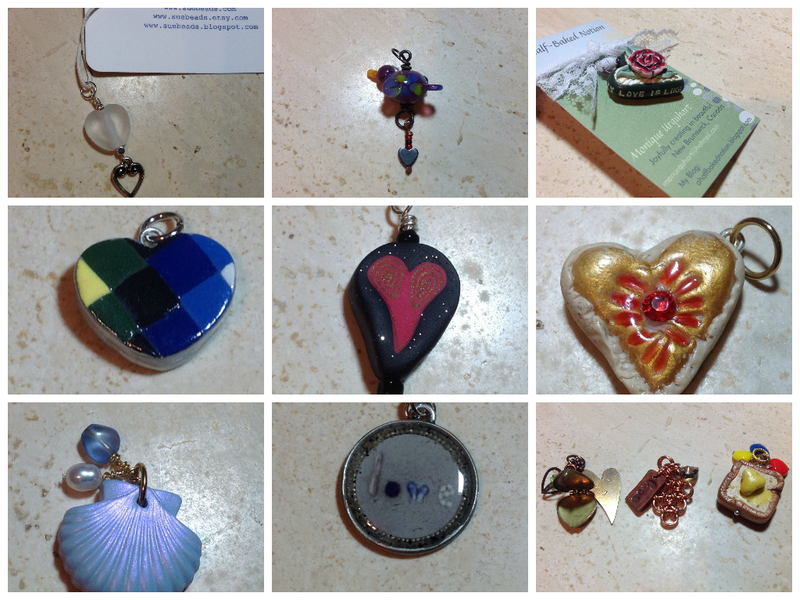 Please visit the other participants of the 2013 Art Charm Exchange and Beads of Courage Auction. 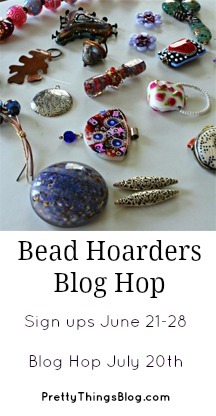 This entry was posted in Blog Hops, Challenges, Charity, handmade, jewelry making and tagged art charm blog hop, art charm exchange, art charm swap, Beads of Courage, benefit auction, BOC, charity auction, fundraiser, Glass Addictions, Jennifer Cameron. Bookmark the permalink. Oh, love your charms Lennis! They are really sweet! These are so lovely! I had no idea the amount of time and layers that they must have took – thank you for sharing your process! I really love the premise and the balloons – so sweet!!! The trials of resin!! I had some of my own but you learn something new about what it does and doesn’t do each time you use it right? I love your charms, they are like little painted masterpieces!! Your charm is absolutely wonderful. I cherish it. The time and amount of love you invested into these charms is evident. Fortunately I got one of my own to ogle, and can see the details of the painted lines and the sparkle of the Lumiere paint, the sparkle of the little heart gems, and the color of the balloon. Just wonderful, Lennis! Thank you so much! These are just wonderful charms! I really love that you showed your process, because I was very curious. 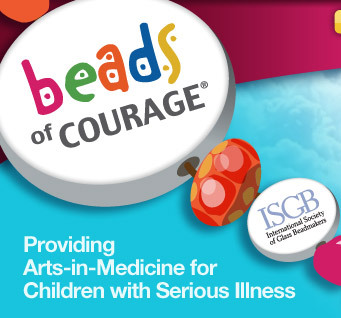 Thanks so much for participating and for helping to raise money for Beads of Courage! These are just adorable! 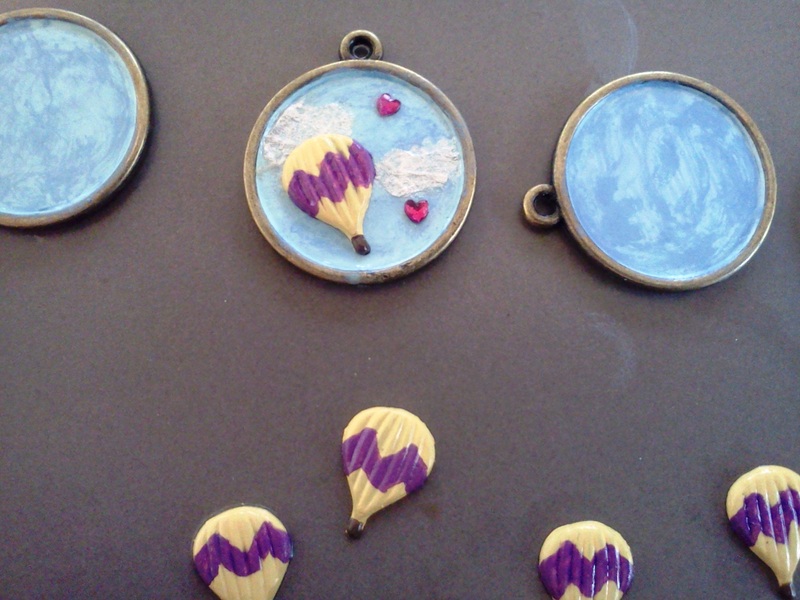 I do love resin but it always seems there are challenges whenever you try something new. 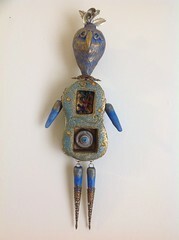 I did not have the courage to go with resin for this auction. You did a wonderful job! Courage is one word for it…lol. I can think of others, but it was too late to change my mind. So, there may be a streak or bubble…they are not perfect, but that’s life and its not perfect either. I was a lucky receiver of one of your wonderful charms!! Just LOVE it and your idea! thanks for sharing the process – I was really curious about that! How unbearably sweet these are!! And thank you so much for sharing your process with us! So happy to receive to of your charms Lennis – so much fun. These are really fun charms! Thank you for sharing your creating process! Sweet little charms, Lennis. I love that you showed the process pictures. It does get frustrating when trying to put components/products together and it doesn’t work out quite how you envision it so one must go to Plan B (thank heaven for Plan B!)! I’ve had a similar issue with ink and resin. I’ve found that, sometimes – not always, spraying the piece lightly with a sealer (I use Envirotex) and letting it dry, then pouring resin helps. Of course I always seal paper, but it just never occurred to me to seal the ink! Thanks. I’ve found I even need to seal the pottery shards I collect at the beach. I ruined 4 bezels (2 large sterling and 2 tumbled glass) when I poured resin over the shards. 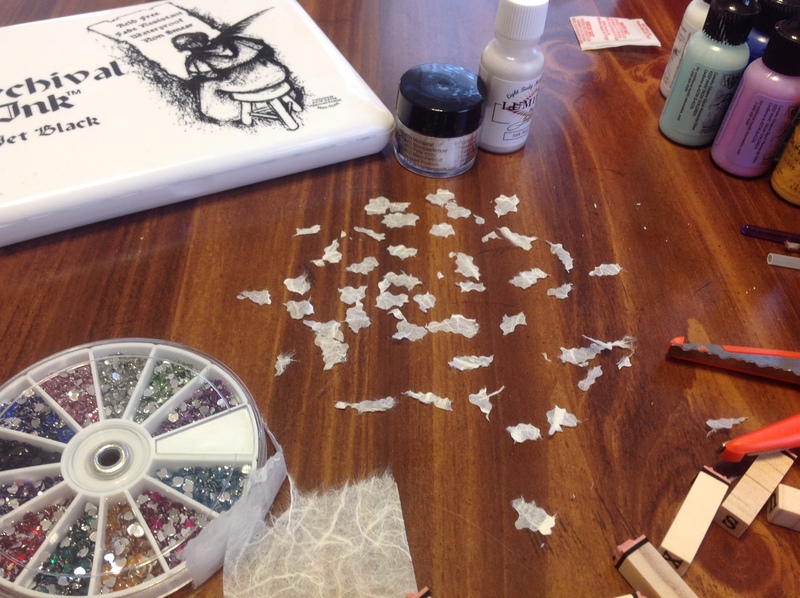 I noticed the next day that the color had leached out of the shards into the resin…..